I don’t think I’ve even seen weather this cold in my life. I actually enjoy the snow and winter activities – but not at -20F pre windchill. Warm and comforting food, please. This soup is light but filling and I ate two bowls, without feeling guilty. It also made the house smell delightful and warm and I’ll let it sit on the stove for the rest of the afternoon to keep that smell. It makes it not seem so cold. Preheat the oven to 400F. 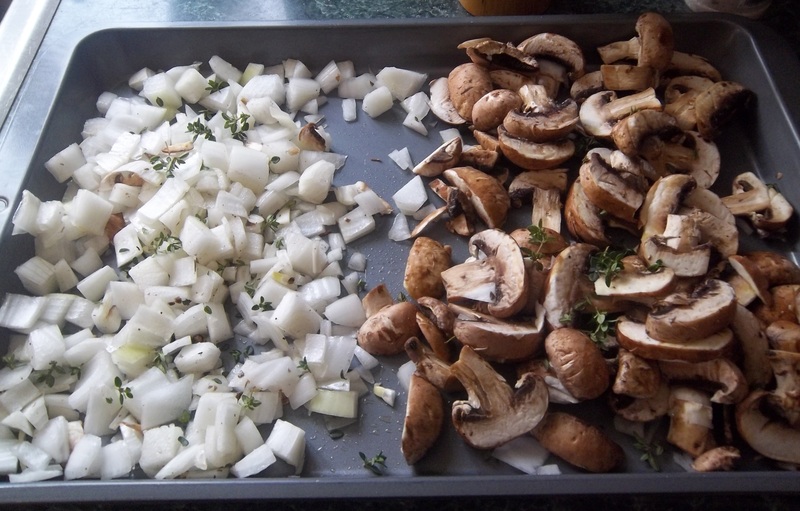 Slice up the mushrooms and place on 1/2 of a baking sheet. Place the diced onion on the other half. Cover each half with 1 tablespoon of olive oil, half of the garlic 1/2 the teaspoon of pepper and a teaspoon of salt for each side. Sprinkle 2 tablespoons of thyme over the top and place in the oven for 10 minutes. Remove and flip the vegetables and place back in the oven for 10 minutes. While they are cooking, In a large pot add the vegetable broth and beans. Add in the grated ginger and the other 2 tablespoons of thyme. Cook over medium high heat and bring to a simmer. Remove about half of the broth (including beans) and place into a blender or food processor (about 4 cups). Add the roasted onions to the blender and puree until smooth. (I ended up doing 2 cups first, then another 2 cups + the onions in the blender). 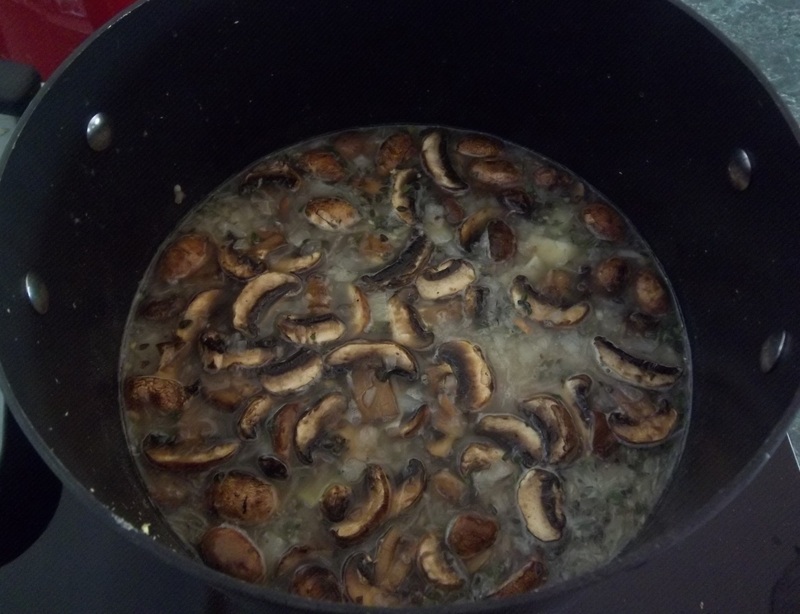 Add back to the stock pot and add the mushrooms. Reduce the heat to medium low, and cook for 30 minutes. Or place it on low and let it cook for a couple hours. It’ll warm you right up and smells delicious! Serves 4-6. 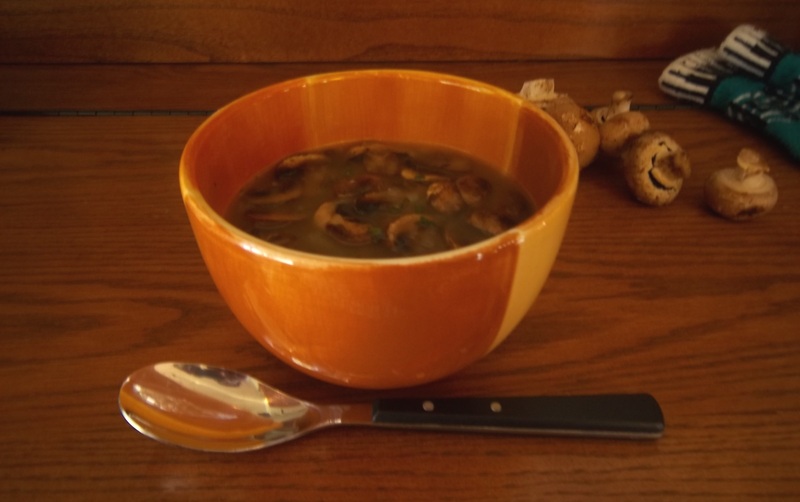 Pingback: Savory Mushroom Bean Soup… | Morning Coffee . . . This soup was sooo wonderful! I love it!!! Thank you!